There are a couple of ways to setup subscriptions for families. The first way is to setup one subscription for the head of the household and bill other member at $0. The second way is to have subscriptions for each family member. Note: the head of the household / parent has to be the one to setup the additional family member, the provider can not setup additional family members. Subscriptions will continue unless they are cancelled by the provider or the client. If there are appointments after the subscription is cancelled they will become unconfirmed and will need to be reconfirmed. Ensuring the provider will be able to setup an hourly rate or no charge the appointments. If an appointment is made prior to a subscription start date then the subscription will cover those appointments. 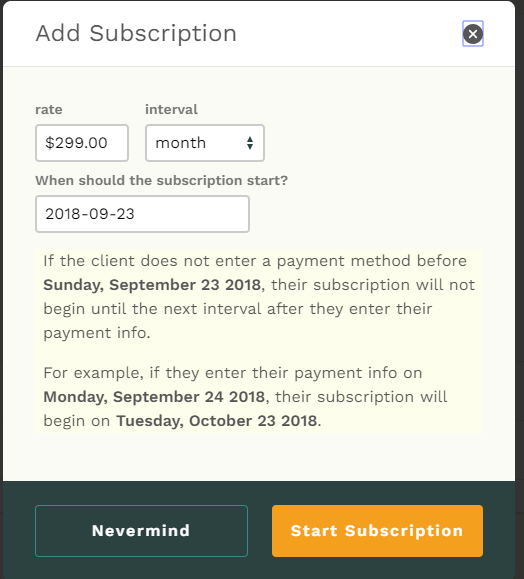 For example, if an appointment is made for $75 per/hr on October 2nd and a subscription starts October 5th and a client payment method is in place the October 2nd appointment is covered by the subscription. Login to Fons and navigate to the client tab and select the family member who is head of the household, select "start subscription"
Note: Make sure to schedule the appointments under the corresponding family members not the head of the household, unless the head of the household is taking lessons as well. Login to Fons and navigate to the client tab and select the family member who the subscription is to be for and select "start subscription"